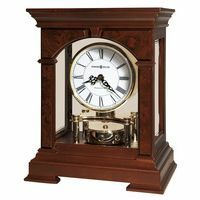 A softly curved swan's neck pediment, turned finial and a full cherry veneer crown return, adds elegance to this clock finished in Glen Arbor Cherry on select hardwood and veneers. At the base of the front locking door is an embossed molding to add the final touch. 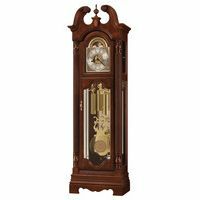 Reeded columns with decorative top caps border the brass finished dial. The dial features raised Arabic numerals, center design and corner spandrels as well as a functioning lunar calendar. 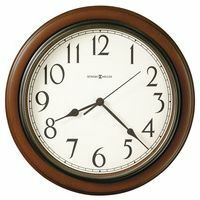 The detailed design on the dial is carried through to the banded weight shells and 8 5/8"e; (220mm) lyre pendulum decorated disk. Two lower side glass panels allow viewing of the beautiful brass weights and swinging pendulum from any angle.